Above: Soak up the iconography of a famous Mexican artist in Mirror, Mirror:photographs of Frida Kahlo, at the Spanish Colonial Art in Santa Fe. 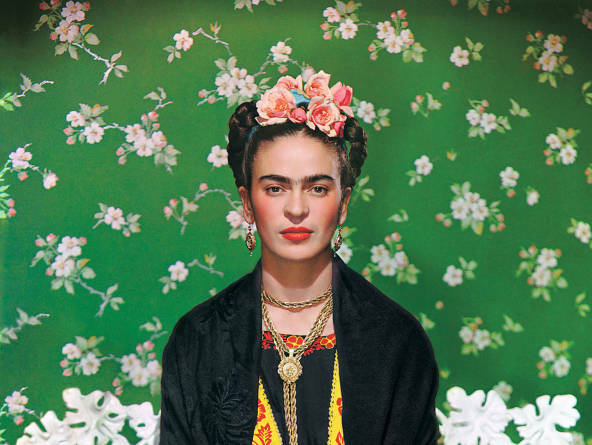 Start the evolution at the Museum of Spanish Colonial Art, which opens Mirror, Mirror: Photographs of Frida Kahlo on May 6 (through October 30). Fans of the Mexican painter turned icon will see how photographers interpreted her—and how she used their shots to craft her image. Nearly 60 photographs from dozens of shooters chart her fabled life—a stern girl posing for her photographer father, a nearly fatal bus accident, a tortured love for Diego Rivera, her embrace of communism, and the final years of excruciating pain and transcendent art. Keep feeding your wanderlust at Cathedral Park, where you can stroll among 92 weather-hardy reproductions of the greatest works from Spain’s El Museo del Prado, May 13–October 31, including ones by Diego Velázquez and Francisco de Goya. In July, the New Mexico History Museum explores the toll war takes on treasured archaeological sites with the exhibit Syria: Cultural Patrimony Under Threat, and the Museum of International Folk Art hosts Quilts of Southwest China, a gathering of exquisite pieces from American and Chinese museums.